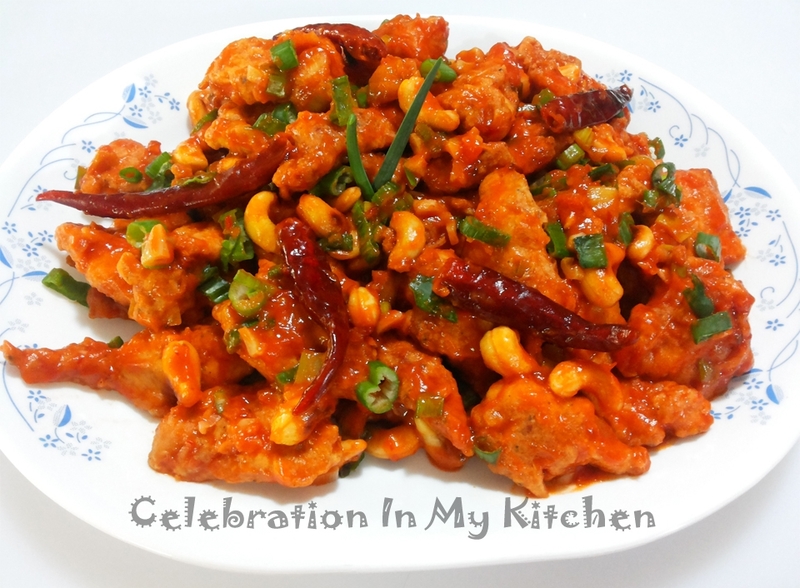 A popular Indo-Chinese dish, spicy, red in colour and prepared with boneless chicken strips. Addition of tomato ketchup lends the colour, balances the heat and adds a sweet note to the dish. It is served garnished with toasted cashewnuts. Enjoyed as a starter or with main meal accompanied with fried rice or noodles. This dish is easy to prepare at home with dark or light soy with the level of spiciness adjusted to your preference. Two processes are involved; velveting and preparation of the sauce. Velveting is a Chinese technique of marinating seafood, chicken or meat with a cornstarch marinade and egg before deep frying in oil or poaching in water. This technique gives a velvet coating to the food thus preventing it from drying out, keeping it moist and tender. Either boneless chicken breasts or thighs can be used with the latter more juicy and tasty. The chicken pieces are coated with soy sauce, chilli sauce, ginger, garlic, pepper powder, cornflour, all purpose flour and egg, then deep fried until crisp. Finally, tossed with green onions, red chillies, ketchup, some more garlic and chilli powder. An addictive and satisfying dish, leaving you craving for more. Marinate chicken strips with garlic, ginger, pepper powder, sriracha hot sauce and soy sauce for few minutes. When ready to fry, mix in an egg with the chicken pieces along with the cornflour and all purpose flour. Fry chicken strips till cooked, crisp and golden brown. Drain on absorbent paper towels. In a wide skillet, heat oil, toast cashewnuts and set aside. Saute the onions (reserving the greens for garnishing), garlic and ginger. When garlic is fragrant, stir in the chilli powder and whole red chillies. Mix in the tomato ketchup, fried chicken strips and rice vinegar. Combine and then add the cornstarch liquid to thicken sauce. Check for seasoning and if required, add salt. Garnish with toasted cashewnuts, spring onion greens and serve warm.